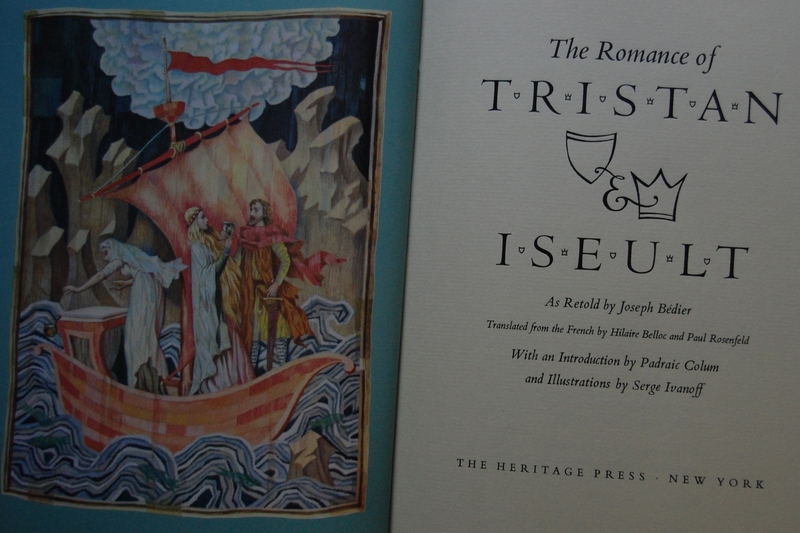 Front Binding – Today I bring you The Romance of Tristan and Iseult. Issued as a LEC in 1960, this Heritage edition quickly followed, and in my opinion it’s a rather amazing book in the post George Macy years. This was originally a French medieval legend told through poetry that has been passed down through many centuries; Frenchman Joseph Bedier provides the foundation of this myth for this edition. 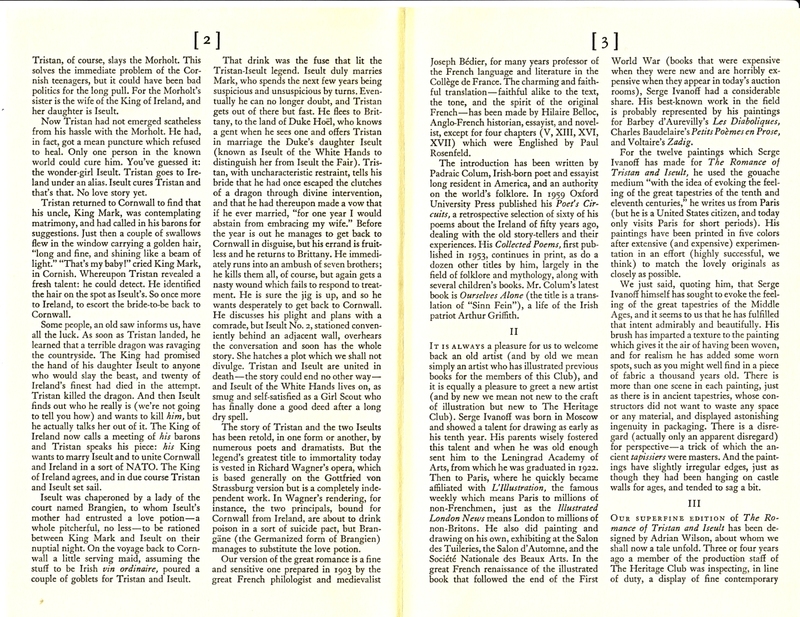 This is a prose rendition of the text. Tristan and Iseult inspired the Arthurian legends that sprung in England; Tristan himself made an appearance in one tale hunting for the Holy Grail as a knight of the Round Table, from what the Wikipedia page tells me. 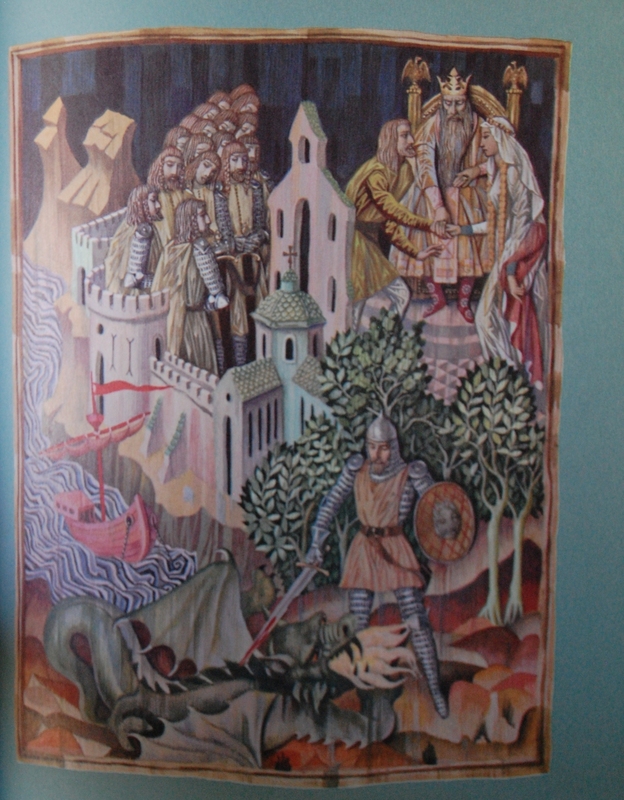 He appears in Lord Tennyson’s Idylls of the King (which does have a LEC/Heritage edition floating around! ), too. Anyway! Bedier appears to have been quite entangled with the legend, as he pops up all over the place on that particular page. So good choice! Illustrator Serge Ivanoff did not leave a good first impression on me. I found his interpretation of Moliere’s two plays rather unremarkable; it’s the sole LEC I may sell off someday out of the ones I have. I have noticed that the artistic style utilized to illustrate that text does not work well for me. T.M. Cleland’s similar approach with Oliver Goldsmith’s She Stoops to Conquer left the same feeling of apathy in me. However, this particular commission? Holy cow, I am impressed. This is a gorgeously rendered book. I’m dumbfounded at the distinct divide in quality and pleasure I derive from his two commissions for the George Macy Company. This came first, and is certainly the more daring of the two; perhaps Ivanoff decided to really show off his talents for this book. Well, it’s all the better for it, as you’ll soon see. 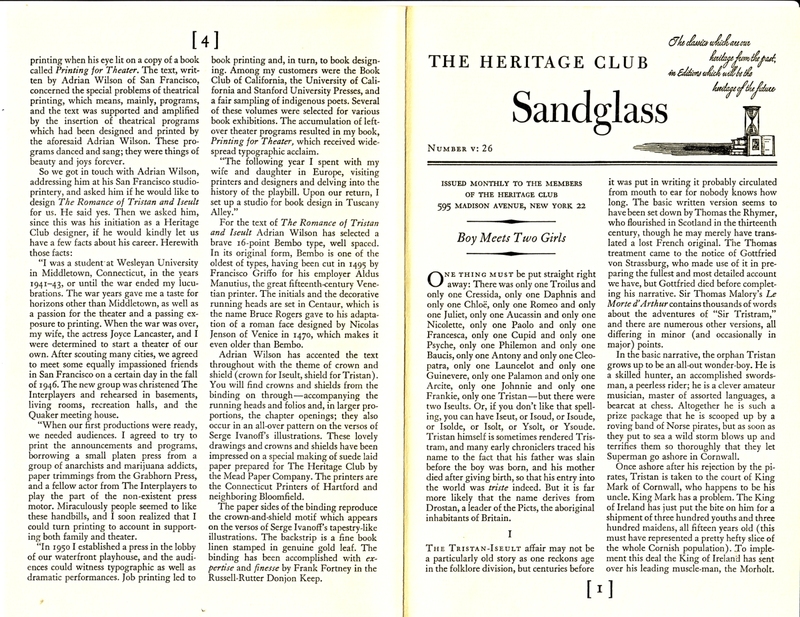 Design notes: Adrian Wilson designed this edition, his first for the Company. He went on to do the Plays of Christopher Marlowe, The Oresteia and Russian Folk Tales, among others, I’m sure. He’s emerging as my favorite post-George Macy designer, because he had an incredible knack for making stunning Heritage books in an age where the quality was diminishing without George’s guidance. His editions maintained a level of class not many others from the 60’s and 70’s convey. Anyway, there’s a bio about him if you’d like to learn more; let’s move on to the particulars of this book. Bembo 16 point is the font of choice, with Centaur (a Bruce Rogers design!) used for the initials and running heads of the text. 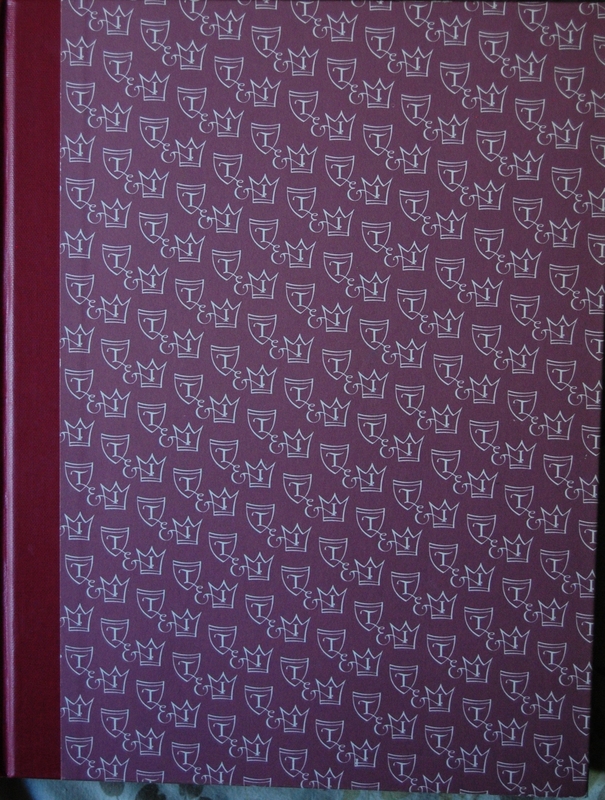 The lovely T&I design is utilized throughout; the illustrations feature them on the back of their pages, even! 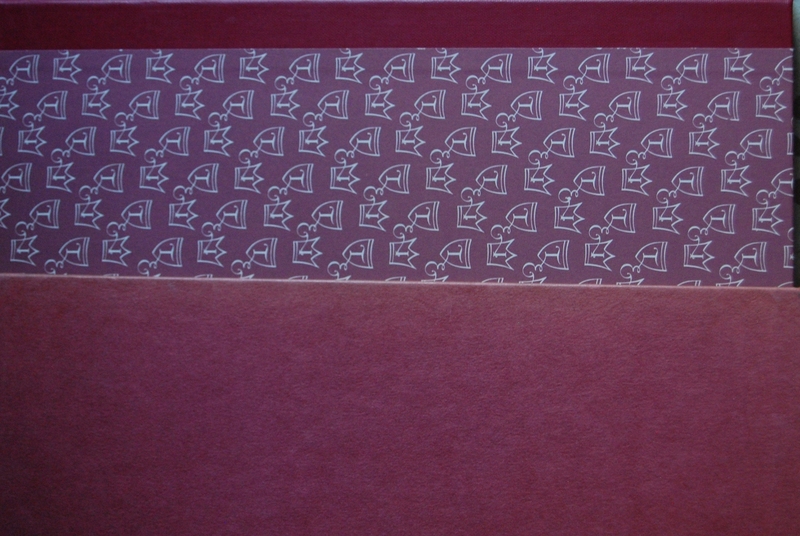 The paper is of a special suede make provided by the Mead Paper Company, with Connecticut Printers of Hartford applying the font to them. Russell-Rutter, that ever-prominent bindery for Heritage (and a few LEC’s!) editions, continues that standard here. Spine – I quite like this one. It’s got a lovely design. Title Page – As mentioned above, Joseph Bidier provides the base of the text, which translators Hilaire Belloc and Paul Rosenfield dutifully render into English. The text is introduced by Padaric Colum. Splendid title page all the way around, from Wilson’s design to Ivanoff’s stunning tapestry-esque paintings. Personal Notes – I traded in a few books at Bookbuyers in Monterey for this one. Definitely a post-Macy highlight if you ask me; I wish Ivanoff could have replicated his success here in the later Moliere. Oh well. 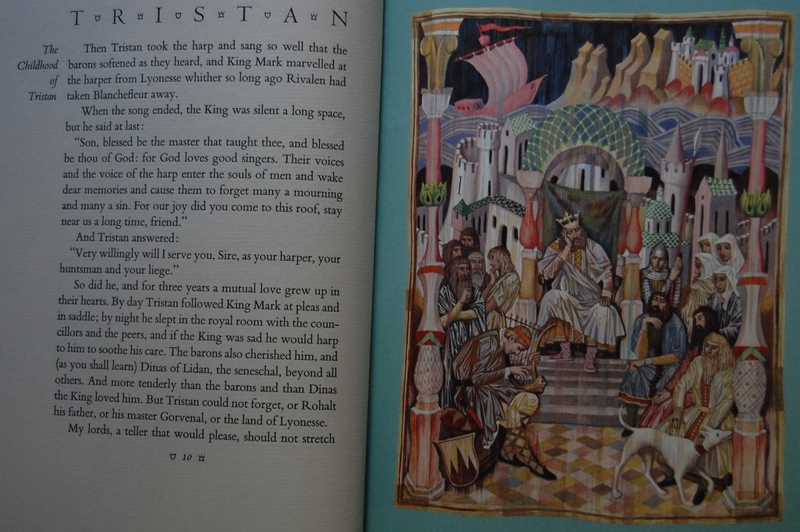 You are currently reading Heritage Press – The Romance of Tristan and Iseult by Anonymous (1960) at The George Macy Imagery.